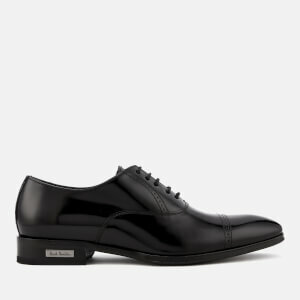 Men's black leather Oxford shoes from PS by Paul Smith. Crafted with a smooth premium leather upper, the 'Tompkins' smart shoes feature a lace-up fastening, an almond-shaped toe and a classic stitched toe-cap. Set on a leather sole with a small stacked heel and embossed motifs to represent a variety of the brand's collections. Complete with foil branding to the footbed. Includes a dust bag.